Daniel originally hails from Nottinghamshire and he began the Cornet at the age of 6, joining Shirland Welfare Brass Band, where he was taught by Marie Smith. Aged 11 he began playing the Trumpet, where he was taught by his uncle, Steve Walton, and he quickly moved onto Principal with the National Children's Orchestra. During his teens, he spent 5 years as a member of the National Youth Orchestra of Great Britain, where he performed at prestigious venues like the Royal Festival Hall and the Royal Albert Hall, under the baton of conductors such as Vasily Petrenko and Paul Daniels. Daniel graduated from the Royal Academy of Music in 2015, where he performed under distinguished conductors such as Semyon Bychkov, Christian Thielmann and Yan Pascal Tortillier. He studied the Trumpet and Natural Trumpet with Mark David, Robert Farley, Paul Beniston and John Hutchins. He participated in masterclasses with Reinhold Freidrich, Allen Vizutti and Jeroen Berwaerts. Since graduating from the Academy Daniel has developed a busy freelance career as a Trumpeter and Teacher. He is a founder member of the Buck Brass Trio and he enjoys playing with a wide range of ensembles including Il Divo, Led Zepplin Tribute Band and the Orion Orchestra. Away from the concert platform Daniel enjoys cycling, discovering new spices to help his burgeoning culinary skills and travelling. Dan plays on 1981 Vincent Bach Stradivarius model 37 Trumpet. As a young freelance Horn player, Timothy Ellis has appeared as guest principal with the London Sinfonietta, Bournemouth Symphony Orchestra, Philharmonia Orchestra and appeared on the soundtrack of Dunkirk. His solo career has included both recitals and concertos, the most recent being a solo recital appearance at the Leeds International Music Festival. Also a keen chamber musician, Timothy is a founding member of the Buck Brass Trio, as well as a member of the flexi-group Ensemble Mirage. Timothy studied at the Royal Academy of Music, completing his undergraduate degree as a first study pianist under Carole Presland, and then his postgraduate as a first study Horn player, studying with Michael Thompson, Richard Watkins, Martin Owen, Katy Woolley, and Roger Montgomery. Whilst at the Academy Timothy worked with many illustrious musicians including Semyon Bychkov, Edward Gardner, Oliver Knussen, and Maxim Vengerov. Other achievements here include winning both the Dennis Brain Horn Prize and the Worshipful Company of Musicians Brass Ensemble Prize with the Buck Brass Trio. Timothy’s studies were gratefully supported by a Countess of Munster ‘Star’ Award, the Oliver Green memorial horn award from the Martin Musical Scholarship Fund, as well as a Royal Academy entrance scholarship. Away from music Timothy is a keen photographer, running a small professional portrait service for musicians, as well as being a keen windsurfer – enjoying travelling down to the coast for this on a windy day. Timothy performs on a Paxman Model 20M French Horn. 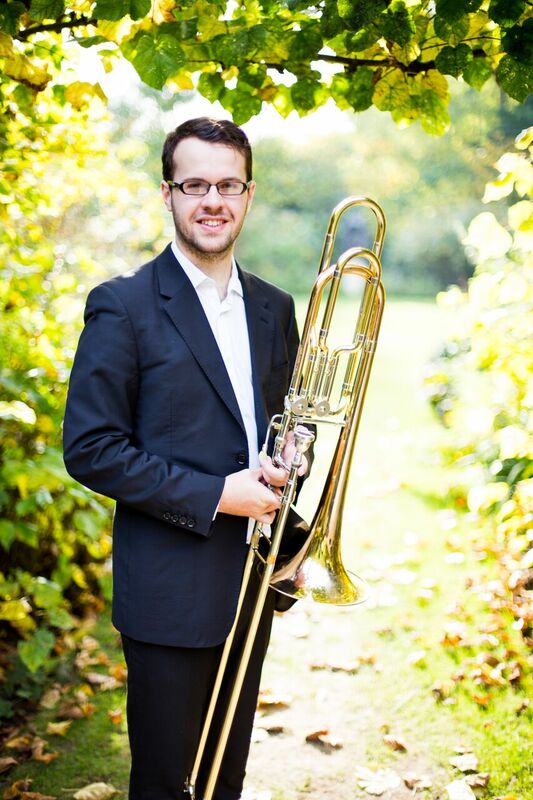 Richard Buck is a London based Bass Trombonist who enjoys a varied schedule as a freelance musician and teacher. He has recently graduated from the Royal Academy of Music where he studied for his Undergraduate and Postgraduate degrees. Whilst at the Academy Richard studied the Bass Trombone with Robert Hughes and Keith McNicoll and Euphonium with James Maynard. He was also fortunate to take part in Masterclasses with Stefan Schulz, Brandt Attema, Ian Bousfield and Jorgen van Rijen. Richard has performed with many illustrious conductors including Sir Mark Elder, Semyon Bychkov, Edward Gardner, Marin Alsop and Trevor Pinnock. He has also performed with ensembles including Britten-Pears Orchestra, London Sinfonietta Academy as well as the Buck Brass Trio, of which he is a founder member. Richard is also a Church Organist. He plays the organ at St Georges Church, Harrow and studies with Simon Williams at St Georges, Hanover Square. Richard would like to acknowledge the generous support given by the St Marylebone Educational Trust, Mark Elliot Scholarship, Harold Nash Award and Larry Adler Scholarship. In time out from his musical activities Richard is an enthusiastic Marathon runner, follower of Northampton Saints Rugby Club and he is slowly learning Arabic. Richard performs on a 1969 Elkhart Conn 62H Bass Trombone.